In June of last year, a 24-story building in the Grenfell Tower public housing block of West London caught fire resulting in the deaths of 71 people. In the public inquiry that followed, survivors argued that a slow response from emergency services, the inadequacy of UK fire regulations, and the general negligence of the British government were to blame for the extent of the tragedy. This week, an activist group called Justice4Grenfell took to the streets of London with a stunt inspired by the film Three Billboards Outside Ebbing, Missouri in order to protest the lack of progress made in their case. “71 dead. And still no arrests? How come?” read the three billboards mounted on moving trucks that caravanned their way through London Thursday morning. 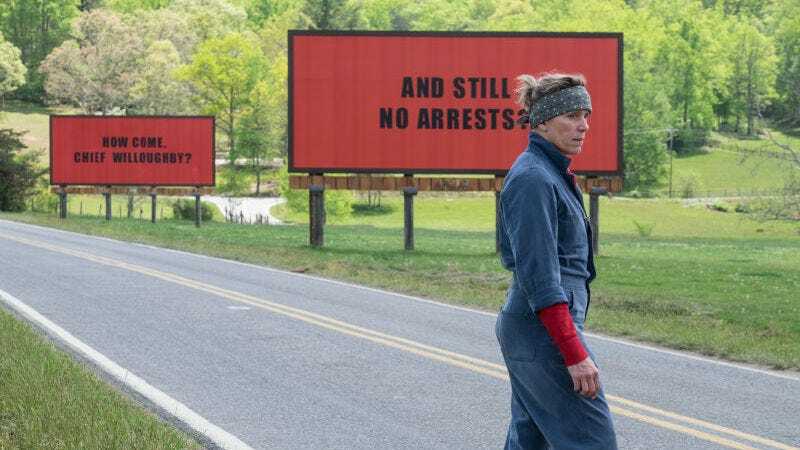 Both the text and design mirror that of the billboards in the film, in which Mildred Hayes (Francis McDormand) erects outside her town to hopefully pressure local police into solving her daughter’s murder. Though these London billboards fail to name one specific individual at fault (a la the film’s Chief Willoughby), the open ended nature of the “How come?” allows the whole of British Parliament to share the blame. The stunt coincided with a protest march of hundreds of supporters, not only demanding justice for those that died in the fire, but support for those who survived, many of whom remain homeless. The Grenfell fire and ensuing aftermath have been underscored by the deep class division that remains in British society, which will no doubt take a long time to mend. But if an attention-grabbing stunt lifted from an award-winning movie helps move things forward in anyway, then let’s do more of that.